Okay, maybe I’m just REALLY old, but why the extra three toasts? The middle “toast” is a verb, “toast” one and three are nouns. Pffftt….this philosoraptor isn’t that good. Toasters don’t toast toast. People toast toast. People turn on the toaster but aren’t toasting the bread themselves, the toaster prior to being activated begins the process of toasting bread all by it’s self…. now if it had said “Does that mean toasters don’t active the toaster to toast bread, but Bread activates the toaster to toast bread..” then your statement would be true, but unless the said person him/herself is physically the “toaster”, it be false i say. It means people toast toast! Damn, forgot to refresh the page, Bluesoma beat me to it. total BS…this stinks of anti-2A to me….comparing the actions of thinking, rational human beings to pieces of bread? not even close to being able to make their point if we are supposed to take it seriously. Philosoraptor is a meme, it’s supposed to be dumb. So using the anti-gun mob’s way of thinking, you can commit murder and get away with it? …”I didn’t kill him, then gun did your honor!” Case dismissed. what kind of retard wrote this? 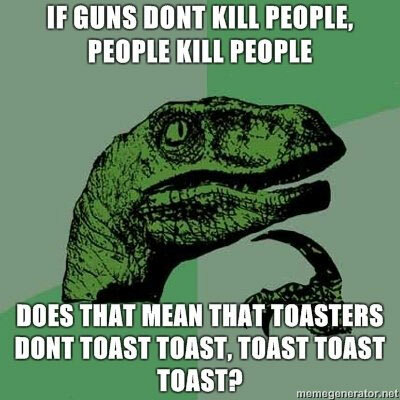 will make sense when guns are called killers and they change what toasts the toast from toast to people.